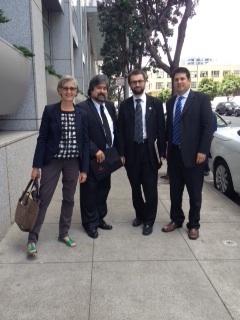 CFI steward Mary Lou Aranguren, president Michael Ferreira, representative Brandon Scovill and legislative advocate Ignacio Hernandez outside the Judicial Council meeting. Judicial Council members deferred action Friday on a recommendation to take up to $6.5 million from the designated interpreter budget for other court costs. CFI officials told Judicial Council members that shifting the funds would deprive a significant number of people from access to justice while violating the federal civil rights requirements state courts must meet. They also detailed recent instances of Californians going without language services and asked the Council to look into why money for language services remains unused despite the availability and need. Before the meeting in San Francisco began, the state Department of Finance asked the Judicial Council to remove the item from discussion because of questions over the trial courts’ authorization to move the money. After testimony from CFI and mention of the Finance Department email, Judicial Council members chose to table the discussion. They will delve about the issue of authorization with the Finance Department in the meantime. The matter over the $6.5 million reserve in the interpreter budget is expected be taken up again during the Judicial Council’s Aug. 31 meeting. The Trial Court Budget Working Group had recommended to the Judicial Council taking the money to offset trial court expenses for the 2012-2013 fiscal year. During the comment period, CFI legislative advocate Ignacio Hernandez reminded the Council that the governor and legislature have previously decided to preserve the funds, which restricted solely for staff and contract court interpreter costs statewide. CFI representative Brandon Scovill also pointed out that a growing list of states are being required by the U.S. Department of Justice to provide meaningful language access to all court functions. He reminded the council that federal officials have said fiscal pressure does not exempt courts from civil rights requirements. CFI President Michael Ferreira and steward Mary Lou Aranguren shared numerous cases in which cases were continued because no interpreter was provided; cases proceeded without language services; and attorneys, mediator and bailiffs acted as interpreters. Read the comments offered to the Judicial Council. Listen to the testimony from CFI starting at 35:20 and read the transcripts of starting on page 18 with CFI President Michael Ferreira.